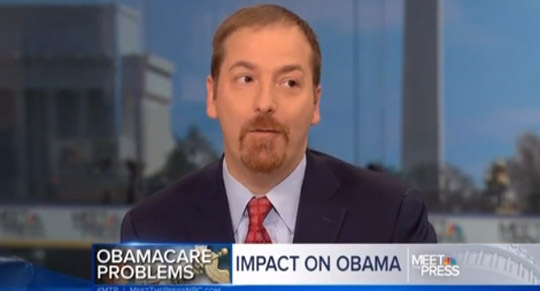 Chuck Todd after Obamacare’s failed rollout: I guess the private sector is pretty great, huh? I often watch political pundits on television and wonder how they can back public policy and politicians with track records of abject failure. Chuck Todd has always seemed like a fairly nice guy, even if I disagree with 95% of what he says on a regular basis. However, after his comments on Obamacare the world now knows that he knows the truth about an ever-expansive federal government. The next time he puts a big smiley face on the president’s plans to consolidate more power in the nation’s capital just remember: he realizes that it’s all a fool’s errand that ultimately only serves the power players in a future America straight out of the founding fathers’ worst nightmares. CHUCK TODD: Okay, that is an acknowledgement that, “You know what? If this was a government operation for a long time and it failed, now we’re bringing in the private sector folks.” I mean, that is an indictment on the whole idea of government as a solution, frankly, when you look at this [unintelligible]. Chuck Todd, David Gregory and the whole gang — they know they truth. And yet, week after week they tie themselves into intellectual knots in order to find ways to defend the indefensible. In an alternate universe, President Obama groveled before private sector hot shots to fix his pathetic health care website, and all of the businessmen he belittled over the years doubled over in laughter. That didn’t happen in this universe, but at least we got to see Chuck Todd admit that there is a sound reason why so many people have faith in the private sector — it usually gets the job done right on the first try because the incentives are there to make it happen. Doug, you watch MSNBC!? Shame on you for giving them bread and butter instead of letting them starve! Emmanuel: Doug watches various news channels for his job. I don’t think he owns a television. I have to consume as much news as possible for work every day across a wide spectrum of sources. One day I’ll hang up my hat for this particular job and it will be a rare day indeed when I watch MSNBC. Maybe in the airport?